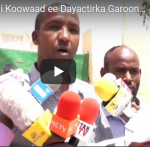 The director general of ministry of public works and housing Mr.Omar Abdillahi Adam (Omar Sayid) has confirmed that his ministry has stopped the issuance of motor vehicle licenses to driver so that they can print new generation licenses that cannot be forged by criminals. “Since March of this year we have not issued motor vehicles licenses and our reason is that we want to classify these licenses to small vehicles and heavy duty vehicles.” The DG stated. 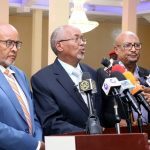 Director General Omar revealed that they are planning to classify the motor vehicle driver licenses to 3 categories so that the drivers of trucks and heavy commercial vehicles are not given the same examination as drivers of small vehicles. “We are in the process of printing drivers’ licenses that cannot be forged. Drivers also have to learn road signs. There are driving schools sprouting in our midst which have not registered with the ministry of public works and housing. We shall ask them how they examine drivers.” The DG said.